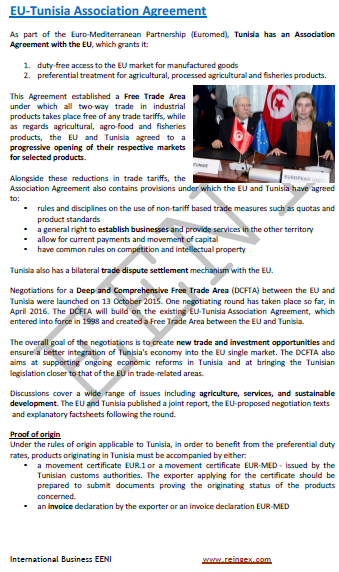 Syllabus of the Online Course (Subject): Agadir Agreement / Arab Mediterranean Free Trade Agreement (FTA). (العربية المتوسطية اتفاقية التجارة الحرة). The Arab Mediterranean Free Trade Agreement (FTA) was initiated in Agadir (Morocco) in 2001 by four Arab Mediterranean countries: Jordan, Tunisia, Morocco, and Egypt. The main objective of the Arab Mediterranean Free Trade Agreement is to establish a free-trade area between Egypt, Morocco, Tunisia, Jordan, and the European Union. 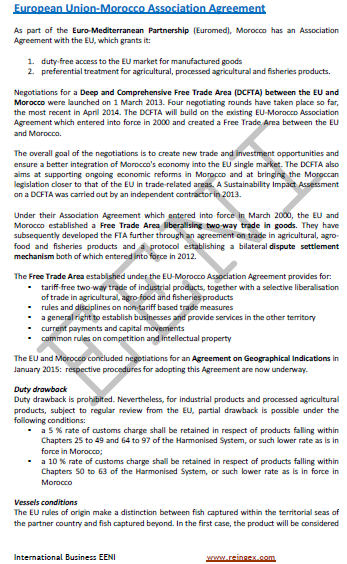 The Agadir Agreement creates a free trade zone of 120 million consumers. 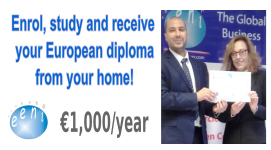 The Agadir agreement, which lies within the spirit of the Barcelona process (European Union), it is one of the regional preferential agreements of the Pan-Euro-Mediterranean System. The Agadir Agreement and the Pan-Euro-Mediterranean system of cumulation of origin. In the Euro-Mediterranean area, the implementation of diagonal cumulation of origin is governed by the rule known as “variable geometry.” This rule stipulates that the economies in this area cannot cumulate the origin unless the Free Trade Agreements (FTA) including a Pan-Euro-Mediterranean protocol origin apply to them.